You'll find different tunes accompanying selected articles on my site. Andrade began her voyage of discovery about the Day of the Dead while working on a research project in Janitzio, Michoacan, in 1987. She fell in love with the celebration and Day of the Dead has now become her passion. Each year, she travels to a different region of Mexico to collect information and make photographs of this unique celebration. What sets Andrade's book series apart from any other writing on this subject is her photographs vivid images full of compassion and love for Mexico and its people. In them, the reader encounters not only the ofrendas, the decorative altars that make this Mexican holiday famous, but also the festive clothing and accessories that reflect the color and meaning of the day. Andrade also captures the celebration through the faces of countless Mexicans and their families in their most sacred hourin communion with their friends, relatives and deceased loved ones that helped create the life they now enjoy. 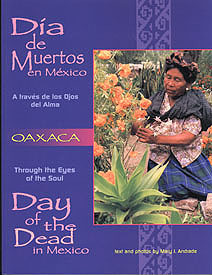 Each book opens with a history of the Day of the Dead in that particular region and goes on to weave a tapestry of culture, history and sociological insight through its text and spectacular photographs. She explains not only how but why each region of Mexico honors the memory of its deceased in a unique way. She shows the colors, foods, and artistic decorations of each region, even though each of these celebrations have the same roots. Her photographs, each composed with a sensitive, artistic eye, show the reader the rich traditions of this holiday as they're tied to the Mexican soul. These books come as close as any can to providing a window into Mexican life. Anyone fascinated with Mexico in general and the Day of the Dead in particular, will enjoy reading these books again and again. All articles and photographs on this site are available for purchase by print and online publications. For more information contact Bob Brooke.